The Windy City Bulls, presented by BMO Harris Bank, the NBA G League affiliate of the Chicago Bulls, will host its first-ever Deaf Awareness Night this Saturday, January 12 at the Sears Centre Arena in Hoffman Estates. The game will tip-off at 7 PM, with doors for the event opening to the public at 6 PM. On this special night, the Windy City Bulls roster will wear specially-designed jerseys that spell out "Bulls" in American Sign Language (ASL) (see example in the image below). The uniforms will be auctioned off with proceeds being donated to the Illinois Association of the Deaf. 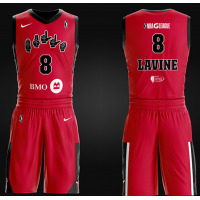 The jersey auction includes each of the jerseys worn by Windy City players during the game that evening and a special autographed jersey by Chicago Bulls guard Zach LaVine, who has been a long-time supporter of the Deaf and hard of hearing community. Bidding on the Deaf Awareness jerseys can take place at https://wcb.cbo.io. The Windy City Bulls will welcome established Deaf performer, writer and professor Crom Saunders to sign the National Anthem before the game and fans in attendance will also have the opportunity to see Matthew "DEAFinitely Dope" Maxey, who has interpreted for Chance The Rapper, Andy Mineo, Bonnaroo and MTV. The organization has arranged to have several ASL interpreters positioned throughout the Arena, including many individuals courtesy of the College of DuPage, during the game to provide translation of public address announcements and other game entertainment that is planned.